Those starry nights were breathtaking and the moon made her fabulous debut! How gorgeous is this dress from Macy’s! 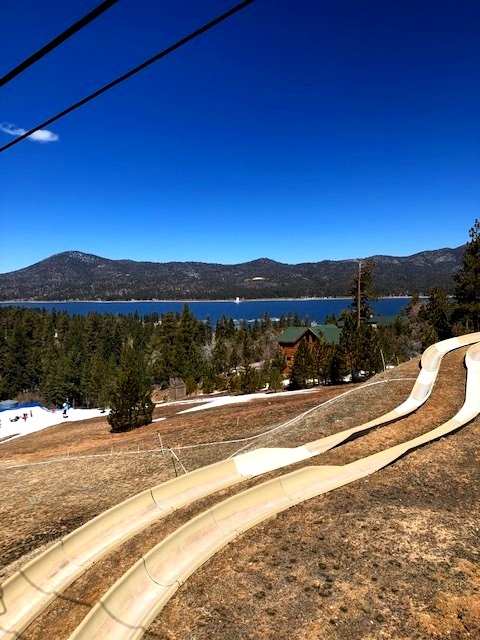 Top 3 Favorite “Lists” to do in Big Bear! THE ALPINE SLIDE AT MAGIC MOUNTAIN- California’s only bobsled-experience, it is an absolute blast! As you enter the park, you first have to sign a waiver that allows you to purchase tickets down the slide. As an adult, you can ride down with your child but you can’t go with other people. You have to ride down as a single rider. However, that’s not to say you can’t race your friends down as there are two lanes next to each other (I raced my sister who sadly beat me lol) but it was so much fun! To get to the top, you take a ski-left and slide down and the views of the lake from the top are fantastic! Definitely a must! You can download, print, and bring a release form to skip the line. You can download it HERE! My sled for the amazing Alpine Slide! View of the lake from the top of the slide! A. Cabins 4 Less- affordable, rustic, and oh so cute, these cabins are right near the downtown Village area and they are lovely. Surrounded by pine trees and picnic tables, they are a great way to experience Big Bear. Check them out! B. Big Bear Cool Cabins- a top rental company in the Big Bear area with a wide variety of cute cabins to choose from that are also affordable. C. Lakewood Cabins- owned and operated since 2006, Lakewood Cabins has both one bedrooms and studio size cabins. There are nine total cabins on the property. WonderFact: It is much cheaper to stay in Big Bear on Sunday nights or during the week, especially during peak ski season. If you have the opportunity, the price is cut in half when you don’t stay on Friday or Saturday nights. Log Cabin Fashion! Loving this nature look from H&M! Feeling like Anne of Green Gables in this outfit! 3. NATURE HIKES- If you love the Great Outdoors just as much as I do, then you should head up to Big Bear, even for the day, to check out some amazing hikes. I have attached a link to check out their various nature trails in/ around The San Bernadino Forest. You can also frolic among the beautiful nature walks and paths that surround the lake. At this time of year, in between the snowy ski season and spring, unless you are equipped with the proper snow boots, there are only a few trails available where your feet can stay dry. I found this beautiful meadow near an alpine trail that we took photos at and I loved this dress so much, I had to dance around in it. Dancing in the moonlight in my beautiful dress from Macy’s! Dancing Queen in 20 degrees! LOL! It was chilly to say the least!